This is NOT a method that I use, approve of or recommend in any way. I have heard from several sources that it has not been crystal clear in this - the last "rollkur article". But here I will clearly state that the opinions expressed throughout this article represent some of those who use the method and the quoted explanations are theirs, not mine. If you want to read about the theories in full context, please see the original articles. They are listed below. I don't necessarily agree with the logic of the explanations, nor do I agree that the overbending is horse-friendly, promotes relaxation, or anything of the kind. I think that that's simply an attempt to justify the use of this method to gain complete control over the animal by robbing it of its balance, and taking a vice grip on its neck. Control is the true purpose of the deep method, in my humble opinion. For more information on the Low, Deep and Round training method, the rest of their training system and more information, please refer directly to the trainers that are using the method, their videotapes or to the articles and interviews in horse magazines or on the web. I read Sjef Janssen's explanation in an article in Dressage Today covering the Global Dressage Forum (It's a Small World After All - Dressage Today Dec 2001), that he started to elaborate with the LDR method (Laag, Diep, Rond) after an English dressage judge had commented that his horse was too short in the neck and hollow in the back. In the article Forward, Deep & Round - Dressage Today Oct 2003, we are told that a "Grand Prix horse in the 1980s who had conformational problems with a strongly developed underneck and a tendency to stiffen the back" is what inspired him to develop the deep'n'round method. Warming up LDR, laag diep rond. He also claims that this method was originated from the problem he had with a young colt he had originally bought for his daughter. Sjef Janssen, His Philosophy of Training - Horsemagazine.com This horse Sjef managed to get a place on the Dutch national team. "I couldn't get him on the bit, he was extremely difficult in the mouth, very sensitive, I could not even touch him in the mouth or the back would be gone again. He was also very hot and very sensitive to the leg." he says in the same interview with Horse Magazine's Chris Hector. Sjef later focused more and more on the training of others, and especially dressage superstar Anky van Grunsven. She was successful before the advent of Janssen, too, but not to the extent she is now. Most of the Dutch competitors on the international scene train for Sjef since he is the national Coach, or use either his method or methods like his. 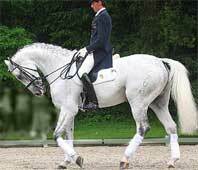 The van Baalens are an exception, since they train for Johann Hinnemann, who speaks out against riding the horse tightly compressed. If anyone has seen or read this article that was 'soon' to be published, please alert me to its whereabouts. Only the top of the neck lowers. 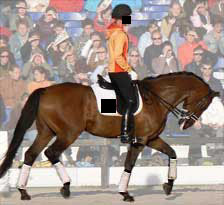 The goal, according to animal physiotherapist Solange Schrijer, is to get "maximum development and maintenance of looseness in movement", or so she claims in the article A Scientific Foundation for Deep, Round and Low - Dressage Today Dec 2001, based on her lecture at the first Global Dressage Forum. Also, it is meant to "conserve the horse's locomotive system and support psychological health", but how this comes about is not specified, other than deep being 'good' compared to 'up in a static competition frame', and that lowering the head is calming (it stops babies from crying). It is implied that it is better to ride with the neck low at times than to ride 'always up'. I would be the first to sign that statement, provided that 'neck low' is really low in the neck and not just 'chin to chest' with the neck still relatively up, as seen in the all to frequent photos of 'extreme roundness'. Solange Schrijer draws paralells to grazing horses when she speaks of 'round'. Still, picturing a grazing horse is far closer to the more accepted forward-down-out stretch than to the extreme curling one sees in rollkur, or LDR. The same goes for the explanations in 'Physical Therapy and Massage for the Horse' by Jean-Marie Denoix and Jean-Pierre Pailloux, that Schrijer's research is based on. The texts and anatomical drawings speak of the function that lowering the neck has on the back of the horse, but this is clearly happening more in the Forward-Down-Out position than in the overly round LDR or even rollkur. One can even see that in their own illustrations and drawings. Lowering the neck stretches the back, lifting the head compresses it. Test were made on fresh horse cadavers, testing the effect of lowering the neck on the back. A very interesting aspect on (except that the drawings portray forward-down-out and the photo portrays curling in) this is that the experiment was done on cadavers where all muscles were stripped off and only the mechanical function of the nuchal ligament was examined. With this approach, why would the topline have to strengthen and grow at all, if the work is done by the nuchal ligament? Maybe because the theory is flawed? "...rather than the 2nd vertebra when the horse is overbent/behind the vertical but still up and working". Traditionally, the horse is not 'worked' while stretched long and low, but rather is allowed to relax and move with loose muscles in the rest of the body too, to transport away lactic acid from the muscles. When the horse lowers his neck into a stretch, the poll will eventually be lower than the withers. To hold the horse's head up the whole training session is extremely detrimental to the back, neck and hindquarters. To do it in the name of 'Classical Dressage' is stupid. 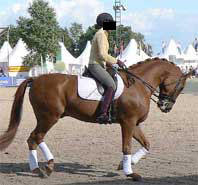 In Schrijer's reasoning, working alternaltely 'deep and round' is juxtaposed to keeping the horse in a 'static position' such as a competition frame, or 'always up' as they call it. To have the horse in this static frame with the poll the highest point for lengthy periods of time would cause contractions and "excess development and/or tone of the upperline muscles", what they call 'upper-line problems'. It includes increased muscle tightness at rest, pain and suseptibility to injury. I totally agree. The relief comes from letting the horse stretch forward-down-out into relaxation, which is very different from having it curl around itself, still working while deep and stretched. The horse should be in a more or less constant play between a relaxing stretch and arching up for work, between relaxing and working, instead. Warming up Low, Deep and Round. If one has the idea that the head should be 'held very up' for competition, there is no wonder they think it's bad for the back to train that way. And thus, Schrijer concludes that not riding deep is bad for horses. The remedy she sees is to get the horse to use his underline abdominal muscles to flex the spine upward, to relax the upperline muscles not to cause tightness. This is only accomplished by "moving through a rapid range of motion exercises, emphasizing flexion of the joints" (A Scientific Foundation for Deep, Round and Low - Dressage Today Dec 2001). To accomplish this, the horse is driven to engage his hindquarters while controlling the speed of reaction, and using full range of motion of all joints. This speedy contraction is what conditions the abdominal muscles, but "it must be done in a posture that facilitates this contraction of the underline musculature and that is the round and deep position" (A Scientific Foundation for Deep, Round and Low - Dressage Today Dec 2001). But in another article (How the Horse's Back Works - Dressage Today Nov 2003), she says that this kind of training is useful for the muscular system since the abdominal muscles together with the sublumbar muscles (minor psoas and iliopsoas, the muscles below the thoracic vertebrae and sacrum) must counteract the increased tension of the bow. "Forward traction on the nuchal ligament (which) places the supraspinous ligament under tension, causing the lumbar area to lock; This locking increases the work of the abdominal muscles and necessitates the compensatory action by the lumbo-sacral and coxo-femoral joints." Traction on the nuchal ligament? So, does rolling the neck in extremely make it easier for the abdominals to round the back, or does it make it harder? Is it maybe so that the increased control that the neck posture gives, is the real training advantage one gets, and it has nothing to do with the abdominals at all? The quickness of the reactions to the leg supposedly engages the abdominals and the sub-lumbar muscle groups, and arches the back from behind, with or without it being 'locked' by the traction on the nuchal igament. There is no logical explanation as to why the horse has to have his chin to his chest to accomplish this, rather than working with the neck lowered in forward-down-out or arched to any degree. This, unless they think the underline neck muscles, that contract to take the chin to the chest, somehow reach the belly, which I don't suppose they think. But then, rollkur or deep in itself does not round the lumbar back. It only rounds the front of the back. To work with a very deep head and neck - rollkur with the chin to the chest - fixes the lumbar back in the other direction. Presumably, giving the abs something to work with, then. Like they don't have enough to work with in an elevated, collected position, where the croup is tucked and the lumbar back is rounded? Is it better to work the abs against a 'lock' that increases the work necessary to compensate? Or to do so to get more compensatory flexion in the L-S joint and hips? Isn't that what we see in a lot of 'round' trained horses doing piaffe? A locked lowered lumbar back and the rest of the horse compensating for it, with varying degrees of success? In humans, trainers and physiotherapists haver recently realized, that to get the stabilizing strength in the abs, desperately needed to cure lumbago, to even sit on a horse in trot, to maintain lower back health and a poised look, doing sit-ups is sub-optimal. The muscles become strong in the length and state that you train them in. Those who do a lot of sit-ups, become very good and strong at just that - doing sit-ups. They get muscles that crunch the front of the body together by shortening. To get strong, stable abs that hold the uper body erect and firm, the abs shound be worked in that length (upright torso) by limitimg movement whilst loading, as in boxercise, or riding. In horses, if the lumbar back is locked, the abs will be longer, and work at a fixed length to try to stabilize. They will be trained in an elongated state, and become stronger in their elongated state. Instead, to train for strong, stabilizing abs in the horse, the croup should be as tucked as possible, the lumbar back as rounded as possible, and the abdominal muscles should work in a shortened length, and fix, release,fix, release with the tempo of the gait. And my guess is, that the load of the viscera and the rider is more than enough, even without the lumbar lock created by excessive overbending. Solange Schrijer sees the posture of "putting the horse's head intentionally onto his chest" as a way to "draw the bow (of the back) to its maximum". 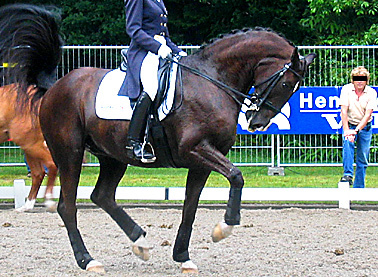 This is the basis for the physical explanation of the benefits of rollkur, as Solange Schrijer describes it in How the Horse's Back Works - Dressage Today Nov 2003. Pectoral, abdominal, lower back and hips (long muscles of head and neck, the brachiocephalicus + scalenus*) - flex and arch the back. * In the original German article, the neck flexors are also considered to be in this group, both in the text and illustration. Schrijer's source material, the book 'Physical Therapy and Massage for the Horse' by Jean-Marie Denoix and Jean-Pierre Pailloux, also count the underneck muscles as part of the underline muscle chain. Gluteus, longissimus and latissimus, splenius, semispinalis, etc. - extend and hollow the back, lift the head and push forward. Something Solange Schrijer forgets to mention is that the so called extensor muscles of the back and rump have another purpose to fullfill. When the grounded, supporting hindleg is placed well forward, in under the load, is bent in all joints and stabilized by the muscles, the gluteus muscles lift the lower back like a crane over the fulcrum of the ischial bones of the pelvis. The cluteus is broadly joined to the longissimus backmuscle by large connective tissue sheets. The tilting pelvis and the engaged gluteus muscle relieves the frontleg on the same side, of its load. 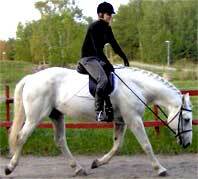 That is very convenient, since for example in trot, the frontleg on the same side is lifted as the hindleg supports. 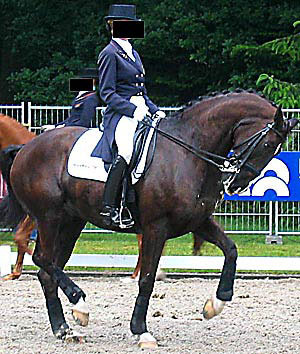 Without this lifting help form behind, the horse's weight falls on the diagonal shoulder of the supporting frontleg. The extensor muscles can lift the back when the hindleg is stably fixed on the ground, bent in all joints and the croup is tucked. 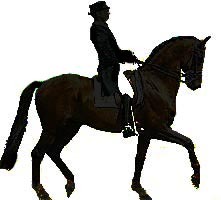 But to draw the bow to the fullest, "for the deep-and-round technique to be used correctly and effectively, a horse has to be round at 4 points..."
"...to balance the use of both underline and upperline muscles at all levels of elevation. 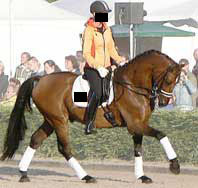 For this technique to be beneficial, there must be an immediate forward and upward response of the horse's hindquarters as a reaction to the rider's legs" A Scientific Foundation for Deep, Round and Low - Dressage Today Dec 2001. I don't agree with Schrijer regarding the 'active flexion' between the skull and 1st vertebra, which should rather be a 'passive release', as well as the flexion between the last neck vertebra and the first thoracial, which is a rather passive function of gravity and muscular release, in the stretch down phase. Denoix and Pailloux also mention active flexion by the underneck, in this way but in collection. Their drawing is one of piaffe. Top Sport Schooling - note the front-heaviness. The neck governs the front part of the back, while the croup and hindlegs govern the hinder parts of the back. So why try to get at the lumbar back by using the neck? Use the hindlegs! To lift the spinal processes of the withers, a mere release of the neck forward, down out is enough to achieve passive traction on the muscles and ligaments. And the poll, well... Does it need active maximum flexion? Why? 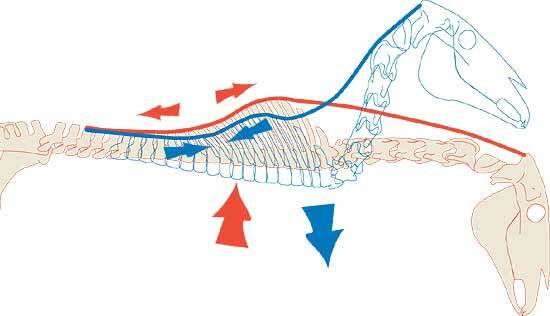 In a stretch, where relaxation and elongation of the muscles is what gives the horse relief and true stretching, the horse should relax, not actively pull the chin in to create maximum flexion of the poll. The flexion one sees in the poll in the upright position in correct maximum collection/work is the result of the upperline de-contracting to let the nose fall down to the vertical. In the stretch down the head should still fall to the vertical. 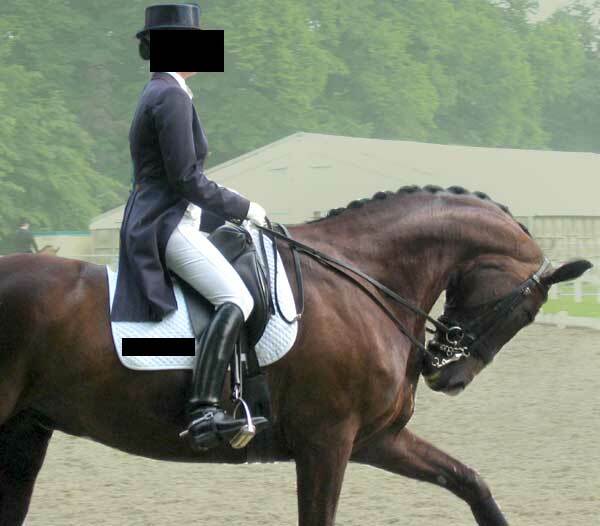 The poll muscles should not work hard in the dressage horse, nor should they have to be stretched out actively to counteract that unneccessary work. 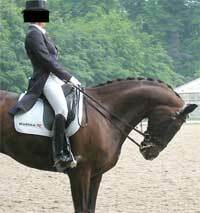 Active underline neckmuscles shortening the neck by pulling the skull and first vertebra closer to the 4th and 5th vertebra. "Bending the head and neck forward - and thus rounding the vertebral column - brings total body relaxation and stops the child from crying." 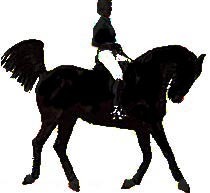 A Scientific Foundation for Deep, Round and Low - Dressage Today Dec 2001. This would then relate to the horse's system of activation and the way it works in a fleeing horse. He puts his head up, and is full of tension and ready to flee. So putting the head down would mean relaxation of the flight instinct. According to Schrijer, the deep method requires physical relaxation, but it also brings psychological relaxation, which is particularly good when dealing with hot horses. 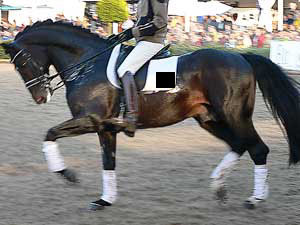 "There is the possibility of mechanical strain from working the horse for too long periods in the maximum stretched position of the joints and from working the joints and muscles at their maximum range of motion" It can only be done in short intevals at first, and later prolongend as the training progresses." 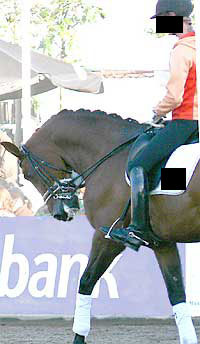 A Scientific Foundation for Deep, Round and Low - Dressage Today Dec 2001. The body adapts to all kinds of strains on it. That's how we can train and build our body up to become stronger and fitter. But there's also over-strain, where the body not only reinforces the structures to handle the load, but builds up a defense against rupture, wear or breakage. Equine studies author Karin Blignault says: "...scientific reviews indicate that such a position should not be held for longer than 30 seconds, since doing so may harm the horse, even to the extent of causing permanent physical damage..."
Other equine physiotherapists say therapeutic stretches must be held 'less than 40 seconds', and most caution 'not to overdo it' because the connective tissue fibers start to give after a certain time under traction. Slowly, research is emerging, saying horses are harmed at the anchoring point of the nuchal ligament at the back of the skull (Insertionsdesmopathien beim Pferd - Prof. Horst Weiler). X-rays showing inflamation, dissected craniums with bony growth to reinforce the ligament are all becoming more common. However, these horses do not appear to be readily diagnosed as having inflamation at the poll, untill thoroughly examined for other types of problems, like shaking head syndrome, unwillingness to go forward, bridle lameness, resistance, etc. The modern theory of riding horses overly round and overbent is still young. Time, and research will tell, I guess. Lowering the neck forward, down, out. But it's interesting to read some older texts. Not extremely old, just from 1939. Udo Bürger explains how the lowering of the neck works in his book Der Reiter Formt Das Pferd. He doesn't speak about the nuchal ligament much, but rather about the muscles along the topline creating the separation of the vertebral processes, stretching the back, relaxing the poll to go on the bit, etc by lowering the neck forward, down out. 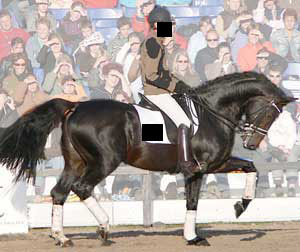 Those muscles are reinforced with strands of connective tissue and arranged at such an angle that they lift the back optimally as the horse lowers his head to graze. Which is a position he should be in 12-18 hours a day in the wild, anyway. And Udo Bürger ought to have known, he was both a veterinary surgeon and a dressage rider, and autopsied horses from all equestrian sports, and noted the difference in muscular growth in the different diciplines. "Sjef Janssens training method presents a 'new training system' that is characterized through extreme bending of the horse's neck". "In analyzing the pictures showing Anky van Grunsven and Idool, in our opinion, two of them show a quite happy, attentive horse with pricked ears. Apparently Idool shows interest in his surroundings. All other pictures give the impression of a repressed horse in an unnatural outline and working under pressure." Then they discuss German legislation about the use of rein aids, and the negative effects of "working a horse constantly or systematically with an extremely tight head and neck set". To this Janssen replies that he is surprised that four adult and educated men cannot read what he has written, that they only see what they interpret and see only the alledged negative parts of their system and attack those. "If they had read the article thoroughly, they would have noticed that the deep positioning of the horse is only one of the methods we use." The crux here is that in spite of what Janssen feels attacked for, the German quartet only have complaints about the overbending part of the method. In my own correspondance with him, he also expressed his discontent that I only show and criticize the photos of the very deep riding, not when the horses are long and stretched or up in a show frame, which he claims is most of the time. In that reasoning, the focus is wrong. I don't focus on them, criticize them, or their whole horse training system - I criticize the overbending, no matter who does it. He was annoyed that I didn't present the full story, but since I'm not interested in them as persons, defending or accusing them personally, why would I cover their whole training system? They do that avidly, themselves (see reference articles at top of page). I don't care who overbends the horse or for what purpose, or if the horses then get to go out in the fields or are fed lollipops. I just want to inform readers that I think it's bad to overbend, and why. A top rider in the warm-up arena. "Our top riders should be aware that they are role models, especially in the warm-up arenas of big competitions". "When talking about the international top riders' positions as role models in competition and even at home, attention should be turned to the warmup arenas. Certainly, the situation has improved a lot during the last 10-15 years, but still you see many ugly sights. This doesn't apply to a certain dicipline or exclusively to top riders." Attention has been turned to the warm-up arenas. But when 'too much attention' is placed on the overbending used in the warm-up, a lot of measures are taken in order to stop that attention, to get the photos away from the interested public, and to silence any criticism.